As flood waters recede and cleanup efforts get under way, Britain’s pets and farm animals have not been forgotten. RSPCA rescue of animals – floods Wraysbury, England. Photos by RSPCA. In the country’s worst-hit areas, particularly southwest England, charitable organisations and companies have teamed up to make sure vulnerable animals get the help they need, from temporary housing to emergency care and food. 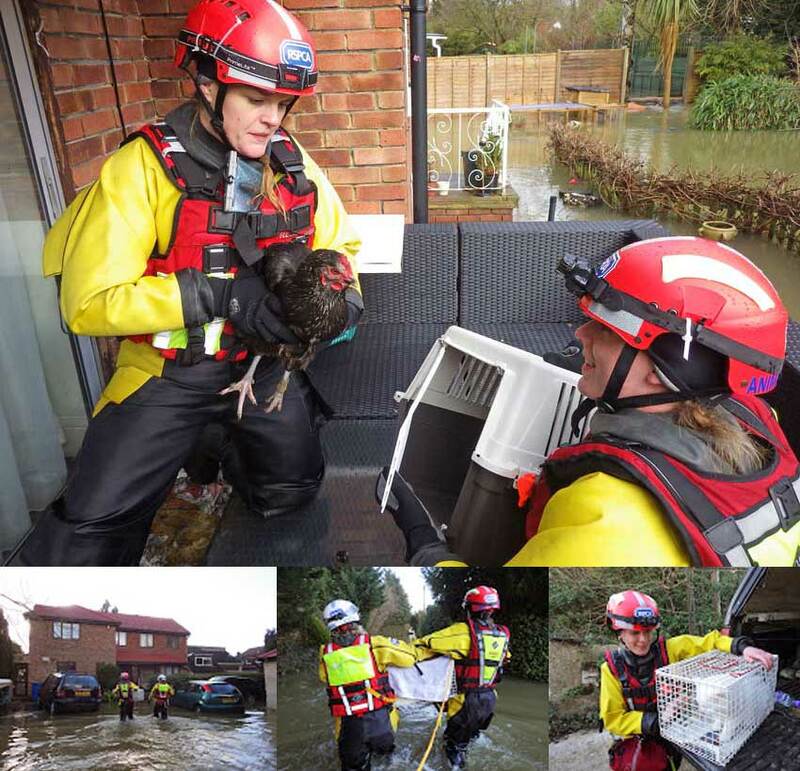 The RSPCA’s dedicated flood teams rescued at least 586 stranded animals in England and Wales – 386 of those in just three days earlier in February. In total, “we were called to attend to and assist more than 7,000 animals during the flooding,” said Sara Howlett, press officer for the RSPCA. The Wildlife Aid Foundation, based in Leatherhead, also offered assistance to pet owners. The charity, whose 24-hour rescue service includes boats, a fully equipped veterinary hospital and some 300 trained volunteers, normally deals with wildlife. Given the unprecedented flooding, however, the WAF is “equipped and resourced for a wide variety of different emergency situations and in the present crisis it is right that we should put our skills at the disposal of the wider community,” said founder and Chief Executive Simon Cowell. Natural pet food makers Natures Menu have been touched by stories of displaced pet owners and their animals, many of whom made it out with a few belongings but without essential supplies. In response, the Norfolk-based company plans to distribute £500 worth of free food to animals in need this month, and is partnering with Somerset-based pet stores to ease the strain on flood victims and shelters that are overwhelmed. “Our hearts go out to the people and pets affected by these extraordinary floods. We know that in difficult times, pet lovers still want to provide the best care for their dogs and cats, which is why Natures Menu is committed to lending support,” said Caroline Griffith, communications manager for Natures Menu. Getting the word out about what assistance is available is a start, but charities said there’s still a need for contributions, either in the form of monetary donations, food or other supplies or emergency housing for pets whose owners are in temporary shelter. They also want to educate pet owners on how to prepare if floods are forecast in their community. Would you know what to do? First, it’s important to listen out and keep an eye on official updates, such as from the Environment Agency. International Cat Care has guidelines for cat owners, which includes advice on keeping all your pet’s medications and documents in a safe, waterproof container. The Blue Cross, too, has tips on how to stay alert to and prepare for staying safe during flooding. If you do have to seek assistance, it’s likely there will be an impact on your pet. All animals can be troubled by uncertain circumstances and surroundings. The experts at CatChannel.com have the following advice, which is applicable to all pets. A pet may become more aggressive or self-protective after a crisis. Be sensitive to the changes and keep more room between the pets and other animals, children or strangers. Animals need comforting, too. Comfort a pet with kind words and lots of pats or hugs. If possible, provide a safe and quiet environment, even if it is not their home. There are a number of articles on PoC about cats in emergencies including one on a first aid kit. This entry was posted in cats in emergencies and tagged animal rescue, cats in emergencies, rescuing cats, rspca by Michael Broad. Bookmark the permalink. yea it would be hard for all cats i would imagine i guess thats why need to be prepared. It would be devasting to lose any of my pets. As i know it would be for any of you guys. its been abit hard over here in new zealand in Christchurch they have had bad flooding the worst in 100 yrs apparently. It’s touching when so many organizations come together, unselfishly, for these causes. I have to ask… Is Simon Cowell a common British name? Simon Cowell is probably pretty mainstream. I don’t know how common it is. Names like John Smith are super common! The Simon Cowell I’m familiar with is the creator of Britains Got Talent, Americas Got Talent and X Factor. I watch them on You Tube sometimes. Thanks Sarah. It does suit us 😉 Hope you are well. Thank you for this excellent article. I will be sharing it also. A brilliant article which I will share. It’s good that some charities care about the animals affected by floods, most people when their homes are flooded can help themselves a bit but animals can’t, they don’t know what’s happening or why. Yes education on what to do is very important and could save animals lives. It must be very hard indeed for indoor only animals/cats. I don’t know how Gigi or Molly would deal with this kind of thing. It would be very difficult to manage them. I’d be pretty worried about just losing them – if they ran off scared and never came back or something since they don’t know the outdoors.